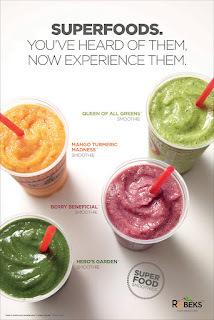 Robeks Fresh Juices & Smoothies, the family friendly, go-to spot for nutritious smoothies, fresh juices, and bowls is introducing a brand-new menu that incorporates a new line of products to compliment many of their long-standing customer favorites. “We felt that with a change in the industry, especially as consumers are becoming more educated on various health attributes, we wanted to make sure that our product mix fit exactly what consumers were coming in our stores looking for,” says Robeks Director of Marketing Matt Furman. This latest menu iteration at Robeks features a few new categories of products, one being a superfood powered smoothie category with ingredients such as spirulina, flax seed, and turmeric that come together in tasty, unique recipes. They are also 100% dairy-free and 100% vegan. Other alterations to the menu include brand new bowl offerings. Robeks President, David Rawnsley, a franchisee himself, recognizes the benefit the new larger and “easier to eat” bowls bring to the company’s stores. “We’ve seen tremendous growth in the bowl segment and worked to make sure our bowls met our customer’s demands,” says Rawnsley. Rawnsley also believes the new menu, concentrated on innovation and a diverse mix of offerings will help increase sales. A 10 store test conducted across 6 different markets yielded positive sales results for the test locations when compared to the rest of the stores in their trade area. To learn more about the menu or to find the closest location, please visit www.robeks.com.